This article is written to help your company present professional PowerPoint presentations. Need PowerPoint presentation formatting NOW! Contact us. 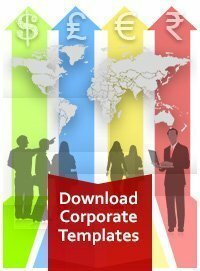 Need a Corporate Style Guide custom created in PowerPoint? Contact our sales team. A Style guide is nothing but a classification of rules or guides for a specific application. Ultimately the goal of using a corporate style guide is to provide consistent visual design across all materials created by a company. This article will specifically discuss how a corporate style guide can be applied to a Microsoft PowerPoint application. It will also offer a few tips we have learned from creating corporate identity guides. Our first corporate customer contacted Chillibreeze about five years ago. The customer was a professional consulting firm and they wanted Chillibreeze designers to create general design guides and a corporate style guide for their consulting firm. Like many corporations, an elaborate style guide was being created so that a consistent look and feel could be applied across all applications. Our customer specifically wanted style guides for Microsoft PowerPoint and Microsoft Word applications. The customer was extremely satisfied with the PowerPoint Style Guide we created. Chillibreeze continued to serve this customer by providing “next day” PowerPoint presentation polishing services. As the months passed by, our customer began sending examples of other visual elements that they wanted to implement. Our designers began to provide slide options on each PowerPoint deck so that the customer could choose the best presentation layout that communicated his/her concept. We had to create custom icons that fit the new and emerging look. We encountered the same situation with our Microsoft Word presentations. Each whitepaper had more and more graphic elements which communicated concepts or comparisons which did not fit the previous style guide format. Both Chillibreeze and the customer discovered that while we had a set of guidelines and ready-made tools, we were not using them. In fact a new style guide began to develop over the months. You could say that this new style guide was much more practical as it developed via an informal process by applying actual PowerPoint content to the most efficient and professional outcome. As with the above scenario, businesses often commission a style guide as a solution to creating a common look and feel for their company. Too often usability issues creep up and the style guide begins to constrain the PPT developer. In such cases, the end goal of creating a common professional look is finally achieved but at the cost of effective visual communication. 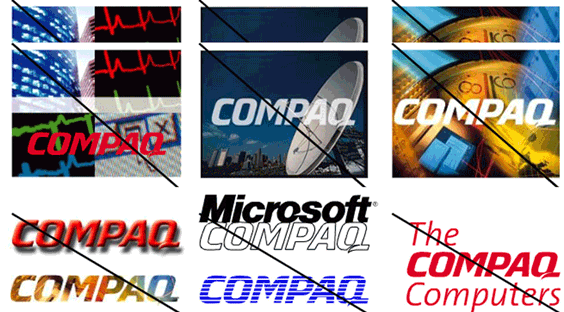 The following is an example of how important a company logo and use of color is for a good corporate style guide. Logo implementation across applications needs to be clearly established so that a professional tone can be created and the brand protected. 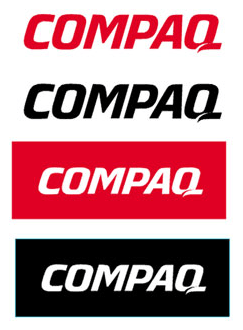 Compaq Dos are very clear: The image below points out that Compaq only allows their logo to be used on solid background colors of red, black or white. Do not place logo on busy or photo backgrounds. Do not use the logo text as different colors, do not mix with other brands, and do not use the logo as a read through. All too often, a style guide becomes too huge, out-of-date, and difficult to implement. Our suggestion: Instead of commissioning us to create a style guide equivalent to a simplistic rules book, let us become part of the process. Together we can learn and understand your needs and how your company uses various applications such as Microsoft PowerPoint, Microsoft Word, OneNote and Excel. Based upon your usability of these applications we can see your requirements and create what we call “style guide templates” that may actually be used! Contact us today to find out more about creating, rather evolving style guides for your company. We suggest the best option and starting point for small and medium enterprises (SME) would be creating the logo, tone of the company and various template style guides that first focus on the application most used by SMEs. Contact Chillibreeze to learn more about our Corporate Identity design services.